The Martin Luther King Jr. Day, also known as the MLK Day, is an American federal holiday which is observed annually on the third Monday of January. As a spokesperson for civil rights and justice, Dr. Martin Luther King, Jr. was a central figure of the civil rights movement. After his death, labor unions, politicians and leaders from all walks of life rallied to make his birthday a national holiday. President Ronald Reagan signed the bill into law on November 2, 1983. As a native Georgian, my primary education was heavily influenced by the history of the civil rights movement. On my way to an elementary school, I walked by Morehouse College, the alma mater of Dr. King. Rev. Andrew Young, a former Atlanta Mayor, ambassador and a colleague of Dr. King, spoke at my summer enrichment program. Jean Childs Young, an educator and Andrew Young’s first wife, often spoke at my high school, North Fulton-a magnet school for international studies. Many African-American leaders and educators cite the civil rights movement as their inspiration to create their own schools, businesses and non-profit organizations. While speaking of their civic duties, I note when leaders share insights on their pains and struggles along with their successes. As per Joseph Campbell in his book, The Hero With a Thousand Faces, the hero must face a series of trials. On page 81, Campbell states, “Once having traversed the threshold, the hero moves in a dream landscape of curiously fluid, ambiguous forms, where he must survive a succession of trials.” These trials are tests to reveal the purpose of which the hero was chosen, uncover inner strengths and serve the greater good. Dr. King’s civil rights trials are well documented. The history vaults have records of his arrests for participating in nonviolent protests. 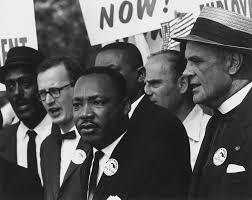 After one of his many arrests, Dr. King wrote the essay, “Letter From a Birmingham Jail” which became an important historical document in support of nonviolent social change. As I study the hero’s journey, I am faced to understand that at times the hero does not meet their ultimate goal during their lifetime. Usually, the hero begins the journey and then must pass the baton to the next person to carry on their mission. From scripture, Moses does not lead his followers into a Promised Land; Joshua does. For various reasons, the continuous starting of a journey and then passing it on to the next generation is an integral aspect of our human condition. It is a part of the hero’s journey that is not usually praised or valued. Our hearts may become hardened when we see that our dreams are not realized in our expected time and manner. However, if we look beyond our own personal timetable, we can see that the person who starts the race does not have to be the same person who ends it to win. The idea of ‘teamwork’ may take generations. Whenever I think about leaders like Dr. Martin Luther King, Jr., I acknowledge that they live a purpose driven life, but that not everyone agrees with them all of the time. As a result, they have to deal with critics and those who oppose their efforts. Again, this is a part of the road of ‘trials’. However, what these leaders must have are loyal supporters. Their tribes, or support systems, are their families, colleagues and communities that lift them up and encourage them along the way. At times, we may underestimate the power of groups, but their influence is very important. There is strength in numbers. Watch any nature show to see that animals who break away from the group and wander alone are eventually captured by predators. To be a part of any group or relationship, one must be willing to compromise and negotiate outcomes. At the same time, one must be true to personal goals and values. Being authentic also has challenges. According to the poem, “All that is gold, does not glitter”, written by J.R.R. Tolkien, “Not all those who wander are lost.” It is difficult and disappointing, but you may be required to travel alone for periods of time until you find a situation that is in sync with your values, or one with the capacity to support you on your journey. Be unwilling to sacrifice your deeply felt values for the temporary satisfaction of others. Be aware. Avoid being seduced by the dark side of the force (energy) just to be accepted. During a short period of solitude, find ways to connect with your inner voice. Seek out like-minded individuals and activities that allow you to express your talents. Eventually, your honest and sincere efforts will be rewarded by meeting persons seeking the same. You will find people who share your beliefs. Do not let adversaries make you a liar; stay true to yourself. Leadership begins within. The MLK Day holiday is observed by special community service projects, workshops, religious programs, parades and celebrations. I definitely appreciate the sacrifices Dr. King and many others contributed, and continue to do so, to make our world a better place for everyone. This year my heart has a renewed appreciation for the sacrifices innovative leaders endure to make changes. They are not always recognized and treasured while they are alive. Generally, like Moses, their journey ends, and they pass on the baton to the next leader. Those who dig wells are not always the same people who get to drink from them. Let’s consider that the hero’s journey is not just our lifetime, it may take generations. Eventually, we’ll get there. Campbell, Joseph. (1949). The Hero With a Thousand Faces. Princeton, New Jersey. Princeton University Press.